A collaboration between scientists in the UK and the USA has shown that gene therapy can give life-long protection to the light-sensitive photoreceptor cells responsible for colour vision in a mouse model of the most common inherited eye disorder. Results published in the journal Molecular Therapy demonstrate that the preserved cells were able to drive visually-guided behaviour, even in later stages of the condition and despite becoming less sensitive to light. 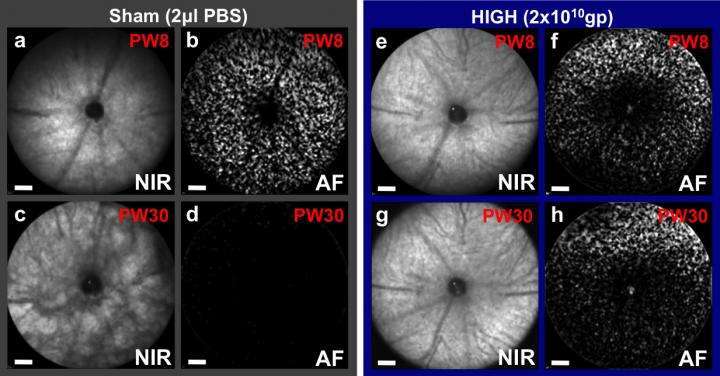 These findings are significant because they open up a new line of research to prevent nerve cell death in retinitis pigmentosa and age-related macular degeneration. They may also have a wider application to neurodegenerative disorders such as amyotrophic lateral sclerosis (ALS). The research was led by Professor Robert MacLaren at the University of Oxford's Nuffield Laboratory of Ophthalmology and funded in the UK primarily by Fight for Sight, with addition support from the Wellcome Trust, the Health Foundation, the Medical Research Council, the Royal College of Surgeons of Edinburgh, the Oxford Stem Cell Institute and the NIHR Ophthalmology (Moorfields) and Oxford Biomedical Research Centres. Retinitis pigmentosa (RP) affects 1 in 4000 people, with symptoms that typically appear between age 10 and 30. Night vision and peripheral vision go first, as the photoreceptors active in low light - the 'rods' - start to degenerate. Eventually the condition affects the 'cones' - the photoreceptors responsible for central, detailed, colour vision. The current study looked at a mouse model of retinitis pigmentosa in which the mice lack rhodopsin - the main pigment in rod photoreceptors. At age 4 weeks - after rod degeneration was underway and before cones were affected - the mice were dosed with a virus modified to produce human ciliary neurotrophic factor (CNTF) protein in the retina. "Our results in this mouse model of retinitis pigmentosa clearly show that CNTF treatment can both give life-long protection to cone photoreceptors and preserve useful vision. While there remains a lot to understand, for example on the role of rods in cone preservation and translation to human retinal anatomy, this is a very promising study," said MacLaren, Professor of Ophthalmology at the Nuffield Laboratory of Ophthalmology. "We already know from clinical trials aimed at preventing motor neuron loss in ALS that high-dose systemic treatment with CNTF causes too many adverse reactions to be tolerated by patients. However, our results suggest that directly increasing activity in the class of genes that were upregulated in our high-dose CNTF group has the potential to provide a novel, targeted treatment for retinitis pigmentosa and a range of neurodegenerative diseases." "One of the most exciting prospects about these results is that the CNTF treatment was able to preserve vision even though rod degeneration had begun. This is a top priority for people with inherited and progressive eye conditions such as retinitis pigmentosa and AMD. As with any new line of research there is still a long way to go before any treatment could reach the clinic, but it is certainly possibly to look ahead and see that there will be a day when we can prevent sight loss with complex genetic involvement."